Quick: There is a giant hot dog on wheels outside of your office. What do you do? That's right, you go for a damn ride. If you've never seen the Wienermobile in person, it's a treat. It's basically a Chevy truck chassis that was chosen to not lead a boring life as a box truck but instead circles the nation with the body of a big wiener on top of it. Not that kind of wiener. Grow up. 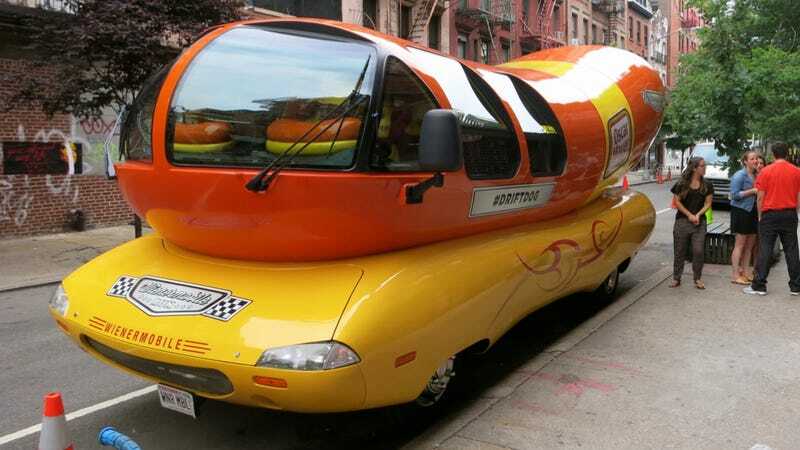 This Wienermobile, called #driftdog, is one of six that exist in the country. They are currently touring the nation as part of the Wienermobile Run, which is basically a series of challenges taking place all summer across social media using hash tags. The Wienermobile I got to ride in, #driftdog, is actually in last place right now for some reason. Maybe because they aren't constantly drifting. Wienermobiles are only driven by people within Oscar Mayer. They come straight out of college, are typically marketing or PR students, and get a one year assignment to drive the big dog all around the country, participating in events and spreading the gospel of delicious meat. They get about four weeks off during the year, but other than that, they're on the highways and byways of America, making people smile and getting some great experience. The inside of the Wienermobile is a strange mix of Chevy truck, 1990s planetarium, and hot dog. The instrumentation and shift gear is obviously from a Chevy truck. The carpeting is like something Miss Frizzle would put in the Magic School Bus. The ceiling of the bus is a blue sky, because it's always sunny in the Wienermobile. And finally, the seats and all other surfaces are ketchup and mustard colored. The dashboard looks like hot dogs. Literally. Driving the Wienermobile in itself doesn't seem like that special of an experience since it is a GM truck chassis. However, that body makes all the difference. The sheer number of pictures that were taken during my ride was insane. People smile, they wave, they run after it. I sent an email around to the office expecting about four people to venture out to see the Wienermobile. Instead, probably 25 people came, with 15 going for rides in the truck. And they were stoked about it. That's what the Wienermobile does, it make people feel like kids again. You're giddy, you're excited. Everyone with the truck was thrilled to work on it, and it showed. If you see the Wienermobile and don't smile, then it must be because one of them ran over your mother when you were young. It's just a hilarious, wonderful experience.